President Barack Obama urged Americans on Wednesday to help him pressure Congress to prevent a Jan. 1 tax hike on the middle class, saying it was up to the public to make sure Washington doesn't "screw this up." "When the American people speak loudly enough, lo and behold Congress listens," Obama said, flanked by Americans who answered the White House's call to detail what that tax increase would cost them personally. "We really need to get this right. I can only do it with the help of the American people," the president said. "It's too important for Washington to screw this up." Obama's remarks were part of a ramped-up public campaign to pressure Republicans in Congress, who have resisted his calls for letting Bush-era tax cuts that chiefly benefit the wealthiest Americans expire. The president wants to extend reductions on income up to $200,000 for individuals and $250,000 for families. But he wants taxes above that level to rise in order to spare popular government programs from the budget-cutter's ax. Republicans want to extend the tax cuts for higher earners, insisting that a tax hike on that group will reduce investments that generate jobs at a time when the economy is still sputtering and unemployment remains high. The GOP has signaled it would be willing to consider boosting tax revenue as long as Democrats agree to overhaul popular entitlement programs like Medicare or Medicaid. But key Democrats have refused to include those programs in talks on avoiding the "fiscal cliff" of tax increases and spending cuts due to take effect Jan. 1. "Let's keep middle-class tax low. That's what our economy needs, that's what the American people deserve," Obama said. "And if we get this part of it right, then a lot of the other issues surrounding deficit reduction in a fair and balanced and responsible way are going to be a whole lot easier. "If we get this wrong the economy's going to go south," the president warned. "It's going to be much more difficult for us to balance our budgets and deal with our deficits because, if the economy's not strong, that means more money's going out in things like unemployment insurance and less money's coming in in terms of tax receipts and it just actually makes our deficit worse." Obama urged Americans who agree with him to call, write and tweet lawmakers (using the hashtag #My2K), or post messages on their Facebook pages. "Do what it takes to communicate a sense of urgency. We don't have a lot of time. We've got a few weeks to get this thing done." Still, he said, "I am confident that we will get it done." The White House says that "a typical middle-class family of four" would pay Uncle Sam an additional $2,200 unless tax cuts are extended for them. That $2,200 figure is the inspiration for #My2K, part of what the White House describes as an "online push" behind the president's approach. 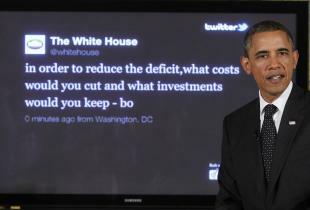 Obama has highlighted Twitter hashtags in past disputes with Republicans: #40dollars in the fight over the payroll tax holiday and #dontdoublemyrate in a feud over student loans. The president, who spoke to top Republican and Democratic leaders over the weekend, was to make brief public remarks at the top of a meeting with his Cabinet at 3 p.m. before huddling with senior executives from major American corporations. • Ken Frazier, President and CEO, Merck and Co.
• Terry Lundgren, Chairman, President and CEO, Macy's Inc.
• Marissa Mayer, CEO and President, Yahoo! • Ed Rust, Chairman and CEO, State Farm Insurance Co. The fiscal cliff refers to an economically painful set of tax hikes and deep spending cuts that come into effect Jan. 1 unless Congress and the president reach a deal.